Truly one of the comfiest experiences of my life. With winter rapidly approaching or even arrived in some locations, I thought it would be a great opportunity to revisit one of my favorite anime from recent times. 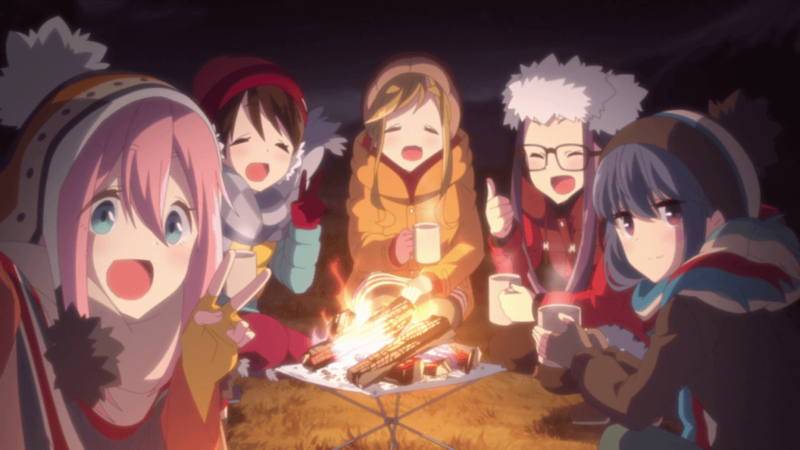 When I first heard about Laid-Back Camp before it aired, I thought, “An anime about cute girls going camping? Japan really has thought of everything.” After watching the show, I came upon the manga it was adapted from and, while still enjoyable, there’s just something special about the anime. We’ve all heard of those moe shows where there’s a cast of cute girls doing something, but little did I know that it would become one I would rewatch time and time again. The story begins with the character of Rin Shima checking in and setting up at a campsite, when she sees a strange girl taking a nap on a bench. After an odd meeting where she gives the girl, Nadeshiko, some curry ramen, Rin discovers that she just moved to the area and got lost while trying to see Mt. Fuji. They part ways, with a new interest for camping sparked in Nadeshiko. Eventually, the two reunite after finding out they attend the same school and begin their camping adventures, bringing and meeting new friends along the way. 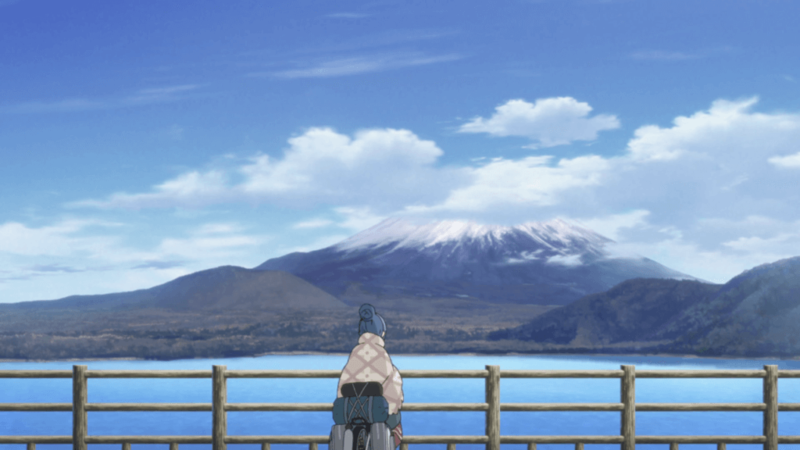 Rin arrives at her campsite with a view of Mt. Fuji. It’s a simple story, and given the nature of the slice of life genre, there isn’t much in terms of development. I think that’s okay because viewers can still enjoy the simplicity in such a tale. Instead, the shining point would be the character dynamics and comedic interactions, as they face the issues of trying to procure supplies and the troubles that come with camping itself. The show also provides occasional camping tips, such as detailing the process of how to start a campfire, and explaining the various types of charcoal! Everyone in front of a campfire! The main cast consists of five high school girls who have all come to love camping in their own way, and eventually all gather to do outdoor activities together. However, I would say that Nadeshiko and Rin are the two main characters, while the other three act more as the supporting cast. Nadeshiko Kagamihara is a perfect example of the “Genki Girl” archetype. She’s a bundle of energy and has an eternally positive attitude, yet doesn’t feel exhausting or overwhelming like other characters of that archetype. Being the “leader” of the group, she is the one that brings everyone together through camping and is usually the focal point of the show’s comedy. Rin Shima is the character that I identify with the most. She is a quiet girl who shies away from group activities, preferring to go solo camping and enjoying the beauty of nature in solitude while reading or being alone with her thoughts. However, she slowly starts to open up after meeting Nadeshiko and getting caught up in her pace. Aoi Inuyama is a gentle girl who speaks with a distinct accent compared to the other characters. She ends up being the mother hen of the group and makes sure that everyone is having a good time. Chiaki Oogaki is head of her school’s Outdoor Activities Club, and is generally a very cheerful character. Though a little mischievous at times, she wants nothing more than to go enjoy a camping trip with all of her friends. Ena Saitou is one of the only people who is shown to be extremely close to Rin besides Nadeshiko. She’s generally a laid-back and free-spirited character who does things at her own pace while teasing Rin and advising her on how to deal with people. She eventually takes interesting in the adventures of the Outdoor Activities Club and joins them in camping. While the animation might not be something to write home about, and the details may not be as sharp as the scenes in something like P.A Works’ Hanasaku Iroha, both fit the source material quite well. The landscape and nature scenes, coupled with the show’s music, sets a very calm and laid-back tone for the show. The music is one of the strongest points of the series and elevates the adaptation to new heights. The manga could be seen as a typical series about cute girls doing cute things while camping, but the OST is what makes the anime shine. The opening song, “Shiny Days” by Asaka, is upbeat and catchy, very reminiscent of songs from The Jackson Five era. The ending, “Fuyubiyori” by Eri Sasaki, is soothing and almost feels like a lullaby sending you off to sleep. The remainder of the OST has Celtic inspirations and is very peaceful, with pieces associated with certain characters or moments. Being a big fan of these types of “moe slice of life” shows, I thought I had seen it all. Then Laid-Back Camp came along. I am captivated by the show’s unique charm and amazing soundtrack every time I encounter it. I recommend this show to any slice of life fan looking for something new to watch with a niche premise. Also, I definitely recommend trying out the curry ramen seen in the first episode. 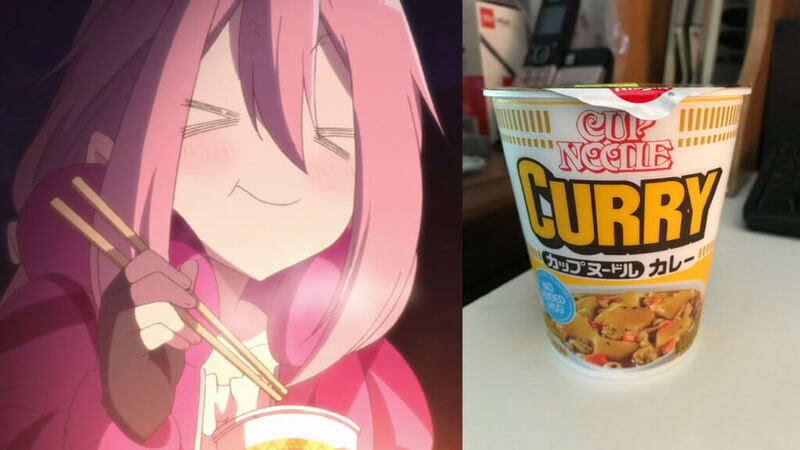 As far as instant ramen goes, it’s become one of my personal favorites, and is as delicious as Nadeshiko makes it seem! While waiting for season 2 and the movie to come out, you can watch Laid-Back Camp on Crunchyroll or check out the first episode on their Youtube channel! You can also learn more about the anime and manga at Anime-Planet! Shokugeki no Soma (and food in general) fanatic. Anime and manga enthusiast. I'm always trying to find interesting things. Please feel free to reach out on my social media!